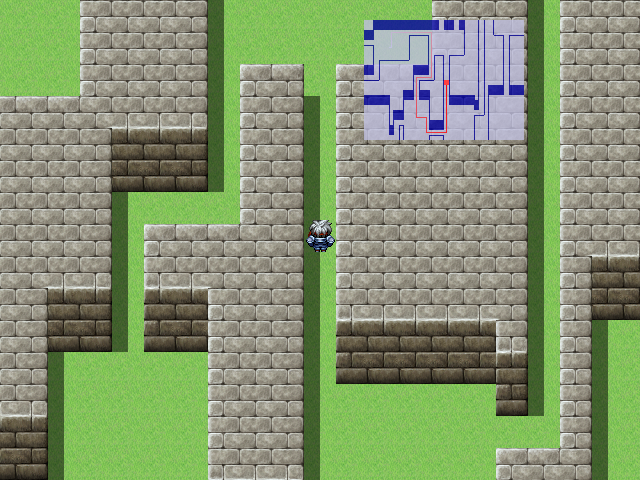 A script that adds a draw path and fog function to a KMS MiniMap script(for RPG Maker VX Ace). To use this script, you need a KMS MiniMap script. It should be below the KMS MiniMap script, above Main. You can change the following settings in the Etude87_KMS_MiniMap module. USE_TRIANGLE_POINT indicates whether the current position is drawn in triangle reflecting the direction the player is facing. The default is true, but changing it to false can be disabled. ALIGN_TRIANGLE_POINT sets the position of the triangular position marker on the grid. 0 is top, 1 is middle, 2 is bottom, and the reference direction is the upward direction (8). USE_MOVE_ROUTE indicates whether to use the draw path function. The default is true, but changing it to false can be disabled. This option is created by adding a function other than drawing a route to this script. MOVE_ROUTE_COLOR is the color of the movement path line. The default value is Color.new (255, 0, 0, 192), which is set equal to POSITION_COLOR of KMS_MiniMap. MOVE_ROUTE_LENGTH is the movement path line length limit. The default value is 50, which means that it will draw the path for the most recent 50 steps. If you walk more than a set number of steps, the oldest route will be cleared. If the setting is less than 1 (0 or less), the old path will be drawn indefinitely without destroying it (but drawing too many paths will load the game into play). LINE_THICKNESS is the thickness of the route line. USE_TRANSPARENCY indicates whether to use blurred path. The default value is true. If you change it to false, you can disable it. If you do not use it as shown below, old routes are also displayed in bold. USE_FOG is the use of the mini-map fog feature. The default is true, but changing it to false can be disabled. USE_OUTLINE indicates whether to use outline processing when using the fog function. The default value is set to true, which will gradually blur the value set by OUTLINE_THICKNESS, but changing it to false will disable it. EXCEPTION is a list of exception handling by map. If it is not in the list, the view is naturally aligned to the full screen shown, otherwise, it is managed through a separate list. The format is as follows: 'map ID => [field of view, range],' (including comma), and ': square', 'circle', and 'lozenge' Rhombus) and so on. In addition, if you write in the form of 'map ID =>: none,', the mini-map of the map of the id ID does not use the fog function.